When I ran out of my favorite sunscreen, I remembered this old favorite of mine and went for another bottle instead of waiting for a week for delivery. 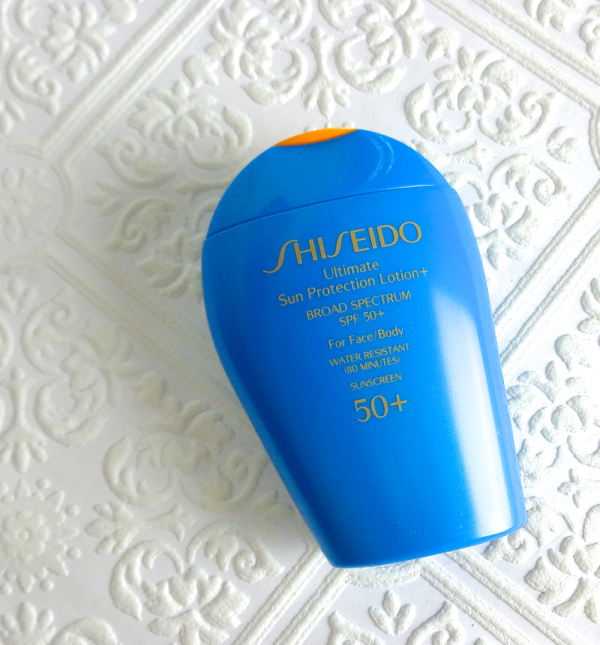 Shiseido Ultimate Sun Protection Lotion+ SPF 50+ is locally available and it has proven to be superior in protection. I mean, this stuff had protected me from the Mexican sun before. This is one of the most cost efficient sunscreens from a high-end brand since you get 3.4 oz for less than $40. However, Shiseido Ultimate Protection Lotion is not for everybody. It clearly has its shortcomings, too. 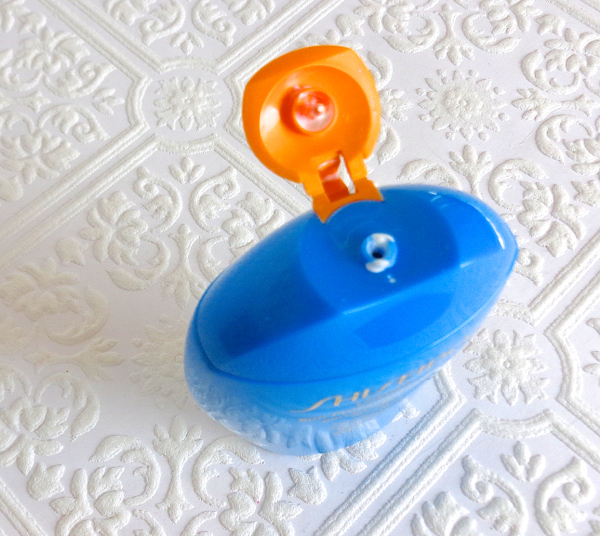 The biggest merit of this sunscreen is its exceptional protection. When I was on a vacation in Mexico years ago, I chose this for my face and Neutrogena sunscreen lotion with SPF 75 for my body. My face did not even get darker by a half shade while I developed horrible rash neck down all over my body. I should have just used the Shiseido. It protects so well because it wears like iron. This strong waterproof formula is virtually bullet proof once set. The sunscreen agent is a good mix of chemical and physical ones, but it has a large amount of titanium dioxide and zinc oxide, which pretty much keep on protecting as long as they are "on you". This persistence is a good thing generally speaking, but it is also something to consider depending on your skin types. The vivid blue bottle is somewhat artistic looking with the slightly asymmetrical design. I detest that the flip top and the opening never stay clean, though. You must be alarmed to see how white this stuff is. It does go on white and leaves quite a visible cast due to the high content of titanium dioxide. I usually go for a sunscreen with both chemical and physical blockers, but this is why I prefer sunscreen with zinc oxide only because it goes on much lighter and has a more natural finish. Once set, it isn't half bad. It is, by the way, a good indication to wait before applying foundation, because a sunscreen needs to set to form a barrier for proper protection. To think about it, this "whitening" finish is both a con and a pro. It provides a very smooth oil-controlling base and easily works as a makeup base. Since Shiseido Ultimate Sun Protection Lotion makes my complexion appear brightened up and smoothed out, I can easily get away with pressed powder applied with a kabuki brush. It creates a nice "my skin but better" effects. However, some of my foundations don't really work with this sunscreen because it does alter the foundation shade noticeably. It applies very evenly on the face but make sure to blend in well on the hairlines otherwise the white residue will bunch up. Not a pretty sight, I tell you. As I mentioned earlier, it is really long lasting and mattifying as well. Great if you have oily skin but I find it a bit drying sometimes for my normal/combination skin. I don't think it is causing breakouts but it isn't exactly non-comedogenic, either. You need a good cleansing oil to remove it and to be more diligent with exfoliation. 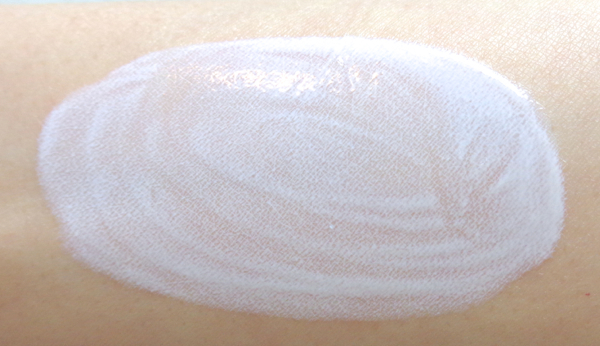 Shiseido also offers a creme formulation, which is my sister's favorite, by the way. It has smoother and moisturizing consistency yet with the same waterproof protection. There is also the "Urban" line with a little less SPF number but with more natural finish, but they are much more expensive compared to the "Ultimate" varieties. 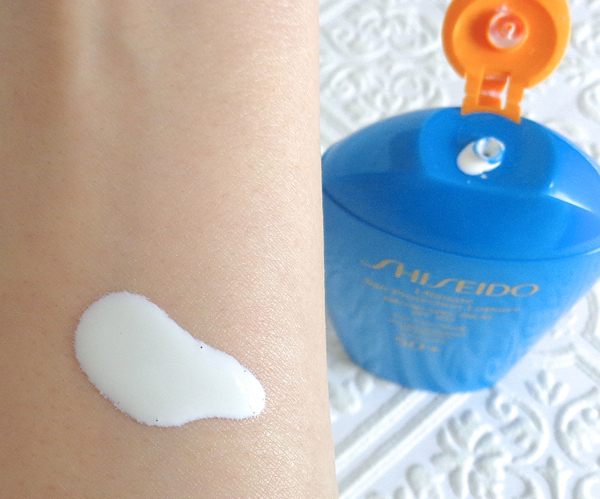 Despite of all the negative factors, Shiseido Ultimate Sun Protection Lotion is still a great choice for me. I just wish it came with a more cosmetically elegant finish minus the green floral fragrance, although it is far better than most options out there. It is like a double-edged sword or something. Sometimes it feels suffocating if I put on the recommended amount, too. But, boy does it last! I think you'd like the Urban line. It is about the same but with less titanium dioxide and added octocrylene. Great review! I'm currently in need of a really good sunscreen, and this may be one that I would consider. Having oily skin and living in Florida, I want to make sure my skin is protected to the max against the sun. Too bad about the white cast though... I'm sure it can be worked around once the foundation sets! If you have time to order from online, I'd go with Biore and even Shiseido FT sunscreens. You might get them sooner than I would since you're located in Florida, too. I love this sunscreen too, and you've made me realize I should get this again. It works so well! I have this one too but it is quite heavy on my skin and definitely not photogenic lol In Asia they almost discontinued the whole line (3 products left) and the new one come in white bottles are physical sunscreens. I agree the initial feeling is quite oily but the oil is an evaporating kind. Once set properly, I didn't feel it was that heavy on my normal/combo skin. If you can get the Shiseido Anessa, go for it by all means! I don't know why we don't get the Anessa line here in the U.S. It sounds like magic Lena...I've been only just this year taking SPF seriously, realizing that I too even though I'm still young getting slight sun spots and I really want to start prevention now. I'm sorry to hear that your neck and body had the rash with that sunscreen! my skin on my face is so incredibly sensitive to sunscreen so I never use standard sunblock brands on my face because they tend to cause my face to sting and get itchy. On my recent holiday banana boast sunscreen really worked at preventing any tanning and burns on areas I use it on my body and my face remained the same with the use of lioele's bb cream! I totally am eyeing shiseido for skincare and want to get their bb cream next! You live in Asia, so I would go with Biore sunscreens if I were you. They are affordable and very gentle on skin not to mention cosmetically elegant. You are so lucky if you can get away with all physical sunscreens! I went through a crazy sunscreen phase and tried almost everything that was supposed to be photo-stable, but nothing was cosmetically elegant enough, so I settled with mixed ones like this. I've always wanted to try this sunscreen but didn't realize it had a sort of whitening effect - which I suppose wouldn't be very visible on my super pale skin. I still might try it one day but man, why does it have to be around $40?! I am pretty sure it would be barely noticeable on your snow white complexion. I wish this one came in a smaller size with a cheaper price, too! Although, the price point is about the same as the Japanese ds ones like biore. I sampled this before but it's too heavy for me. The UV Perfect one however, is great!! If I had an easier access, I'd pick Anessa over Ultimate any day! This is my HG daily facial/body sunscreen... I've gone through countless bottles! It really is the best sunscreen I've tried and it does smooth the skin and functions as a nice makeup base. I'm glad to hear this one is working out so well for you! This is my favorite sunscreen, and I'm on my second bottle! It doesn't stink and it really works! Have you tried the newest Shiseido sunscreen? I received a sample whilst I was trawling the mall but I have yet to use my sachet. I don't think I have. I have sampled the new Urban line but that is pretty much the new one in the U.S. I totally agree that it has some oil controlling properties which is pretty amazing. i have it and I think might use it for my body. I like the cream one for my face better.